Teenage Sherlock Holmes, Watson is a girl, and the story is told from her perspective. This is essentially all the information I needed in order to make the decision to dive into Every Breath at the earliest opportunity. But in case you're wavering, it's also fun to know that this is Australian author Ellie Marney's debut novel, that it is a YA contemporary mystery, and the first in a series to boot. Next up, I think we should just take a moment to talk covers. I have yet to purchase my own copy (that's earmarked for the next paycheck), but both the US (seen here) and Aussie covers have a lot going for them. The Aussie one gets tons of points for having Watts actually on the cover, for one thing. But in a very rare move, I'm leaning US if only because it's not a photo of actual people (never works out well for me) and because, well, his throat. Also his hair and his entire posture. But his throat. That's Mycroft. I love him this cover. Rachel Watts' friendship with her neighbor James Mycroft is something of a full time job. Newly (and unwillingly) arrived from the countryside, Rachel struggles to find a place for herself in Melbourne. Unused to navigating city life after the loss of the family farm, she and her older brother and parents find themselves acting almost like strangers as they adjust to their new home and environment. But then Mycroft enters her life, with his jittery brilliance, his obsession with forensics, and his ongoing allergy to school. And soon her days are not quite as numb, filled as they are with contributing her powers of observation (and cooking skills) to the latest in a long line of Mycroft's investigations. But this most recent involves a murder. And not just any stranger, but that of Homeless Dave—a man they both knew. Unable to accept the official police verdict, Mycroft and Watts set themselves to the task of tracking down the truth behind Dave's violent death and bringing the mysterious killer to justice. I like it in his room—the starry lights, the feeling of sanctuary. I'm still not used to dealing with a lot of other people. I've known Mycroft, and Mai and her boyfriend, Gus, since last November, and they still feel like "a lot of other people." Actually, Mycroft alone could probably qualify as seeming like "a lot of other people." He does so much crazy stuff you could imagine more than a single offender. That passage could just as easily been an entry from one of my high school journals. Other people, man. Not for the faint of heart. I love that the story is told from Watts' perspective. She has very honed powers of observation, though she herself might decry that claim. But it means that not only is she vital to Mycroft's ongoing efforts, she also does an incredibly effective job of introducing the reader to her singular friend. And if her focus is more frequently drawn to to Mycroft than it is anyone else in the room, it isn't any wonder as his magnetism and zaniness and pain fairly claw their way off the page. Gratefully, his presence never overshadows Watts. Not even a little bit, as we are firmly grounded inside her viewpoint and know just how hard she works to keep everyone in her life afloat and not lose track of her own needs, even if she is reticent about voicing them aloud. The mystery itself makes for a fun, often dark ride, and I enjoyed sitting back and accompanying them in their rounds. But the heart of Every Breath is, without question, the chemistry between Watts and Mycroft. Ms. Marney quite simply nails their need on the head. The pacing and development of Watts-and-Mycroft is one long and delicious thread running alongside the unfolding of the murder investigation. As the precarious hold they each have on their lives begins to unravel against the backdrop of Watts' uncertainty and Mycroft's desperation, the solace they take in being together, the rightness of their fit, is so soothing it is tangible. I currently have the sequel on order from Australia and am sitting here feeling antsy just thinking about what these two might be getting up to without me. 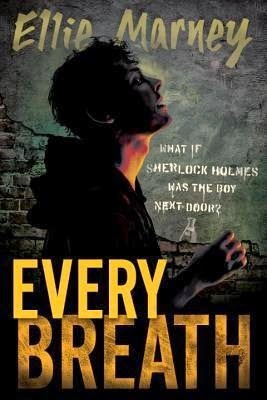 Bookish Antics - "Those who love BBC’s Sherlock should definitely check out Every Breath." Cuddlebuggery - "The quippy dialogue is fantastic." Love is Not a Triangle - "This book is a winner." The Midnight Garden - "This book is a wonderful swirl of atmospheric, gritty mystery and Aussie contemporary and SHIPPY SHIP." My Friends are Fiction - "The real driving force for me in this book was the relationship between Mycroft and Watts." There Were Books Involved - "I ship it so hard." I'm so happy you liked this book. I adored it! Watts and Mycroft are so good. I also loved Watts’ family and the fact that even though things are a bit rough, they stick together. ha ha... I could go on and on about this book. I have already read the second one (also ordered from Australia) and I loved it too. The third book is published in AU in March, I think and it's one of my most anticipated this year. After book 2, I NEED to know how things will turn out. :) ha ha... If you can't tell I'm a huge fangirl of all things Sherlock and this series is a great addition. What other Sherlock(ish) books should I be reading? Yay! I'm so happy I did, too. The tensions in her family were very well done. And just everything between him and her . . . :) I'm seriously on pins and needles until my copy of Every Word comes. So glad to hear it's just as good! The other series I read and loved is Laurie R. King's Mary Russell/Sherlock Holmes series. *Very* different from this one, but just so good. It's set in the years after Holmes as "retired" from investigative work and is told from the point of view of a young woman who stumbles across him and winds up being his apprentice. Sounds great. I read Jackaby by William Ritter. This is another young Sherlock Holmes type. But that book is more of a period piece. I have this one on my TBR pile! Another Aussie YA author I've been meaning to read. It's lots of fun, Chachic. Think you'd enjoy it. I hope so, too! But I know how it goes. Seems I bend whichever the wind blows these days. So, instead of having Sherlock and Mycroft, the author uses Mycroft for both purposes? Interesting choice. This book sounds really fascinating; thanks for the recommendation!